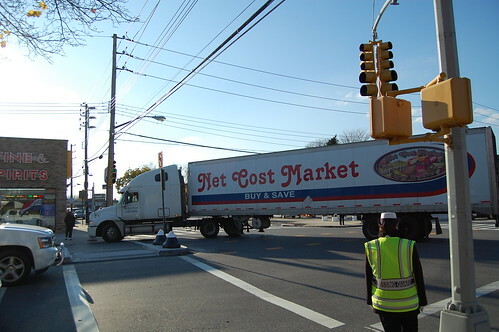 Friday, November 20th GerritsenBeach.net spent about 3 hours between 2-5 pm at that intersection. 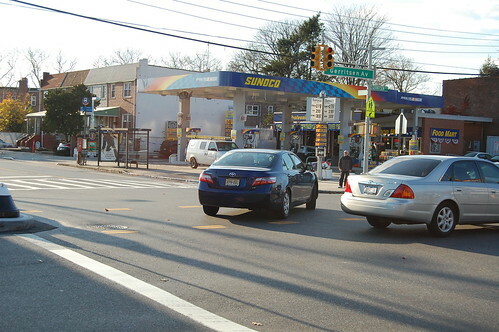 Steve G is right…it’s a nightmare and GerritsenBeach.net belives that this will cause accidents and possibly worse injury’s. Here is the photo gallery. The intersection and Gerritsen Avenue for those that don’t know now features a concrete “green streets like” traffic island at Gerritsen and U, and the length of Gerritsen Avenue is one lane. 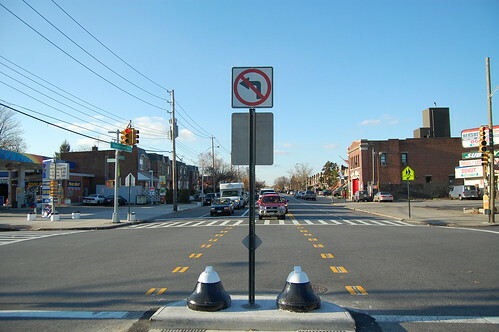 Gerritsen Avenue has left turn bays for the other Avenues such as R, T, etc. 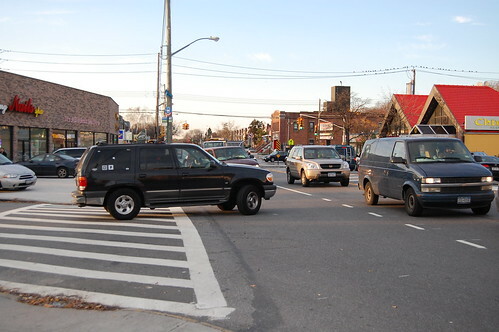 The Gerritsen and U intersection now has a badly needed left turn bay driving on Gerritsen South (driving into Gerritsen Beach) and Avenue U East (currently not installed). More importantly no left turns from Gerritsen North onto Avenue U West (toward Nostrand Avenue). The intersection was a mad house and to be fair this may be due to the new traffic pattern. It may be also due to impatient drivers. However all drivers are impatient, that just how life is, there is no changing that, you cant just take a intersection and Avenue that flows easily cut it down to one lane, and expect society to change its behavior. Joseph Palmieri the appointed Brooklyn Borough Commissioner of DOT shoved this 10 year old plan onto multiple communities and cared less when the community said they didn’t want the plan. Now he left the job incomplete leaving drivers and pedestrians to the mercy of traffic. More to the point…this is what is going on. Making a left onto from Gerritsen South onto Avenue U East is impossible. Since the DOT left the job incomplete, for at least a week now, there is NO left turn signal/arrow yet. The new left turn bay on Gerritsen South can line up about 15 cars. 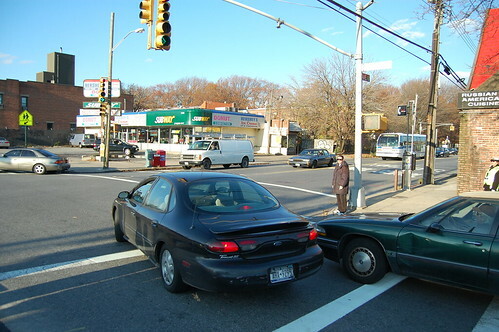 Now since Gerritsen North traffic is now a single continuous lane of traffic when green, the only opportunity cars that can make a left is while red. Only one or two cars can currently make a left. Thats not going to stop some drivers who take it upon themselves jumping from the back of the line driving on the wrong side head-on into traffic to make their left onto Avenue U East. The new left turn bay completely blocks Engine 321. Needless to say appointed Joseph Palmieri forgot about the firehouse. Engine 321 is aggravated, angry, pissed, mad and they were more than happy to explain to me their frustrations since the new left turn bay and island were installed. They explained that the engine cannot make a left or right out of the firehouse at all! They are at the completely at the mercy of the traffic. That line of 15 cars lined up to make a left block their left and right access. Also the island blocks their quick access to drive around traffic to get onto Gerritsen to head to Knapp street or to continue down Gerritsen. They explained that even that morning that had to drive down Knapp street for an accident and it took them “a long time” to even get to Knapp Street. This to GerritsenBeach.net is a deal breaker and grounds to rip up the island immediately. The Knapp Street onto Gerritsen Merge is horrendous. It used to me a two lane to two lane merge. Now it’s obviously a two to one merge. What’s happening for drivers, is that they are forced to merge into each other, not in a nice merge either its a very dangerous low speed merge. However, since traffic at the Avenue U and Gerritsen intersection and the new single lanes traffic is now backed up just from that past Knapp St almost to the behind Knapp Street Pizza. Once you add the Knapp street traffic, it’s IMMEDIATE deadlock, blocking Gerritsen and Knapp completely, Engine 321 also explained this. Since also drivers are impatient that two lane merge with deadlock now becomes a 5 and 6 lane free-for-all as drivers try and get past the merge onto Gerritsen. This deadlock and traffic is now causing Knapp to get backed up past V backing up to PS 194. Which is bizarre. Commercial Traffic! Gerritsen Avenue is not a commercial road. Commercial traffic is allowed on Avenue U East and West and onto Gerritsen for local deliveries. Now the commercial traffic cannot take the same way out they are forced out of Gerritsen onto W, T, S, R Avenues to get back to a road they are allowed to drive on. Keyfood! Keyfood employees and customers are also angry. People driving on Gerritsen South are technically not allowed to make lefts across Gerritsen North into the always filled lot. That’s not stopping anyone. Gerritsen North is filled with cars and these cars are inching their way across the median, across traffic, causing more deadlock. What else are they supposed to do? There is no easy way to get into Keyfood. They would have to go to Knapp, left on V, then deal with the Gerritsen North deadlock to get 100-200 feet. More deadlock on T, S, R Avenues getting onto Gerritsen South. That single lane is also causing deadlock and traffic backups on avenue T, S and R. R seems to be getting hit the hardest due to its short length, bus traffic and close proximity to Nostrand. 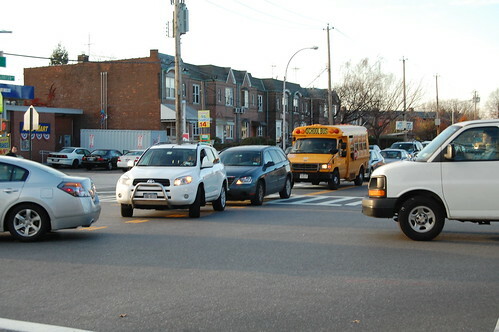 Pedestrian and community safety is now compromised. 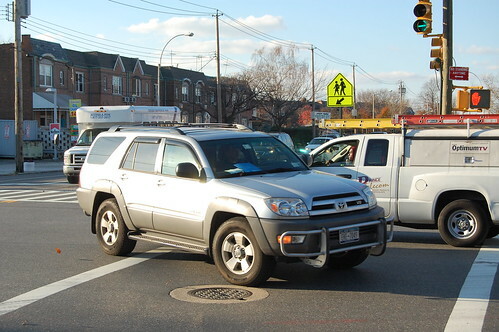 Cars on Gerritsen North are now blocking, to inch up as close as they can to jump the lights, the cross walks forcing pedestrians literally into the middle of Avenue U. The deadlock, blocking the box style, at Knapp, V, U, T, and S have pedestrians crossing, bobbing and weaving through cars to get across the street. Drivers are still making lefts, including light and heavy commercial traffic, city buses, and access-a-rides. We would also like to add that we saw hundreds of empty access-a-rides, who cannot drive. It seems fitting that this came after elections. DOT, Bloomberg, Lew Fidler, Marty Golden, Alan Maisel, God help us. Great coverage for sure. I’m glad you spoke to Engine 321 as their response time is severely compromised now (and I commented on this already). That in itself is HUGE and just one of the most important factors to take into consideration here. What are our ‘elected officials’ saying about this disaster? Any word at all? How can the DOT think that with the increase of cars on the road (especially in the last 10-yrs) that taking away a lane all the way through is possibly a good idea? I just don’t get it. Like I said before in earlier posts, I certainly feel bad for the residents living on Stuart Street between V and U because those folks are affected more than anyone else. Can you imagine how long it must take them to get off their block to turn one single corner? And while I’m at it with questions, do you know why nobody knew this was happening until they were already out there – and only were aware because of the many readers you have on this website? Why were residents not allowed a say in this project like we were concerning the green street project (again, in my opinion, this is the same thing)? Thanks for the info and the time you took to take these pictures and report on the findings. Maybe some of the ‘powers that be’ will take more interest as a result, and I certainly hope that is the case. DOT answers to no one. King Bloomberg doesn’t care a wit about outer boro middle class communities. His focus is the delusion that he can turn Manhattan into Disneyland for the rich, which is economic stupidity writ large. We are now in the post-election periuod hearing talk of layoffs. Yet he allows city funds to be spent on idiocy like this. And it will cost more money to change it back. Their capital projects-the BQE, the Van Wyck, West Street-NEVER END. Streets which are perfectly fine are dug up for no reason, crumbling ones are ignored. Even since Seantor Schumer’s incompetent hack wife was removed, nothing has changed. The word is INEVITABLE. When someone gets hurt or FDNY response costs someone their home(and hopefully no more), we’ll get action. And the City will rightly pay out a huge settlement. @Bugg, Can’t agree with you more Bugg, however even when someone does get hurt or loses their home due to a delayed response from E-321, nothing will change. Bloomberg’s pet project, the problem plagued $2 BILLION UCT (Unified Call Taker)911 system is a complete and utter failure. It has resulted in SIX fire deaths since it’s recent inception, with over 1,300 documented “mistakes” by the new, unqualified dispatchers. King Bloomberg still touts the system as a success, so I doubt he or anyone who serves under his highness will change a thing, even if a tragedy does transpire from this traffic lane debacle. “As to the next reply about election time, I have thousands of reply letters that are sent out year round to refute the idea that we only reply at election time. Hey Lew, where are you when the community needs you? STILL ON HIS 88,500 VACATION!! Lew stop HIDING! Give the money back & answer up! I wzas away on vacation. I do get a life. But I have been working on this issue since before I left. @Lew from Brooklyn, Wnat to win some serious kudos? Give back that $85,000 in campaign matching funds you had no business taking in the first place and direct it to DOT to put things back the way they were on Gerritsen Avenue ASAP. That we could all respect and admire. I’m stuck in traffic and some nut is taking pictures. Joking. Thank you for doing this. Knapp Street has 2 lanes into Gerr. Ave, but the right lane is right turn only. Why would I come all the way to gerritsen when I can turn on Ave V, or W? Got me. The no left turn northbound is a good idea. 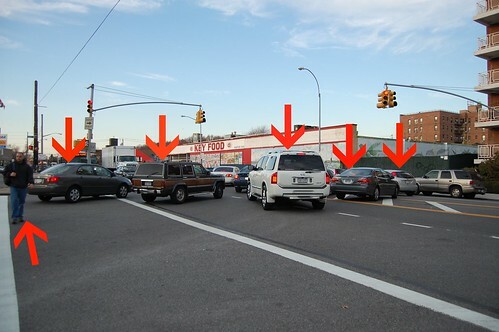 Let’s restore things to 2 lanes, leave the no left turn, add an a green arrow for lefts southbound and on Ave U westbound. INCREASE the length of the green lights, prohibit lefts into Key Food, out of the Mobil Station, and the little piece of Ave U by the Mobil station and have police enforce the rules. Traffic moves, Bloomy gets some cash and I dont have to sit in traffic. @Kevin, I JUST DON’T GET IT!!!! GREEN STREETS? If we our so concerned about the enviornment as every politician has stated (before election), then how does backing up traffic make it green on a whole?? More time idling in a car in traffic, more fuel consumption……. Good Job Bloomburg —- Way to Screw Up A Community ! Aaah, I see they gave you those big metal “bells” on the islands that are supposed to protect pedestrians. Last year, they placed them on newly created islands on Ocean Pkwy. Except when cars hit them, they become AIRBORNE! So they put zebra stripe signs on top of the bells to make them more visible, but the signs get sheared off in collisions. Of course, they’re not replaced. Plus when it snows, you can’t see where the edge of the island is and you bang right into it. Lotsa luck with these “impovements”. You’re gonna need it. Oh and make sure that you’re on good terms with your neighborhood collision shop. What do you call a chinese girl with one leg? @Irene, Does anyone who makes these stupid decisions actually think it through? Wait!! maybe they should be paid more…no no they are too busy with their private consulting firms making more money! I pray no one gets hurt, I mean in an accident! LOL, Eileen is an Irish girl with one leg. And Bob is a guy with no arms or legs that has a nice pool. I don’t get those bells either. How are they supposed to even protect anyone? What a joke! And I’m sure your right Irene, I can just picture this covered with snow. What a mess. This is a wonderful example of important local reporting from a blog. Thanks for the great work! 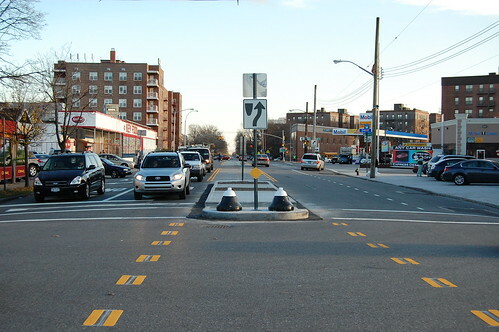 Redirecting cost efficiently — meaning—> You ask for a traffic light, You get painted lines. You ask for traffic light with tuning signal, You get island with NO tuning sign placed on it. Last time we complained about the kids racing on the avenue at night. The Police responded with sidewalk patrol for a few weeks. @Anonymous, That is SO true! It’s almost like your punished for complaining. Like they say, ‘oh yeah, you don’t think there is enough police presence? You think we are sleeping in our cars?’ And then procede to teach us a lesson for complaining. The new design of Gerritsen Avenue is wonderful, thank you to the DOT. It creates a much safer street to cross and bicycle on. 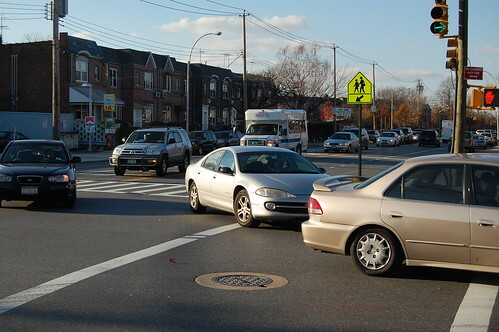 It turns Gerritsen Avenue into a street where drivers must drive the speed limit and pedestrians and bikes can cross the street or ride on the street with much less fear of getting hit by a speeding motorist. Thanks DOT for turning the Gerritsen Speedway into a safe street. @murray, Safer? This morning alone, I saw a command bus and a B31 bus side-by-side at a bus-stop squeezing into that ‘one lane of safe street’ whereby the other flow of cars went around them into the new turning lane essentially into on-coming traffic. That sure seems safe to me. I’d like to see a bike cruising along in that mix of chaos. @Anonymous, The point was: There were two buses squeezed together. Does it really make a difference that it was inadvertently called a ‘command bus’ as it used to be known? 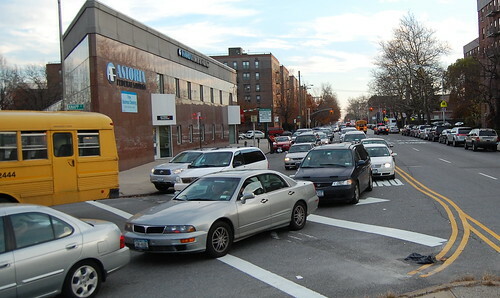 @Anonymous, While there may be a few intersections that need some improvement, the design of Gerritsen Avenue in most places gives ample space for both bikes and cars to ride side by side. The previous design in which there were two car lanes in both directions made biking on this thoroughfare scary and dangerous. There was little space for bicycles coupled with fast moving vehicles. Secondly, cars turning onto Gerritsen Ave, from cross streets will have to make the turns a little bit slower to fit within the legal roadway. 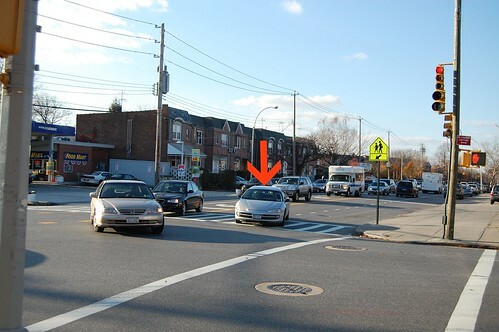 Last winter I witnessed a pedestrian crossing Gerritsen at Fillmore Ave. get hit by a turning motorist. 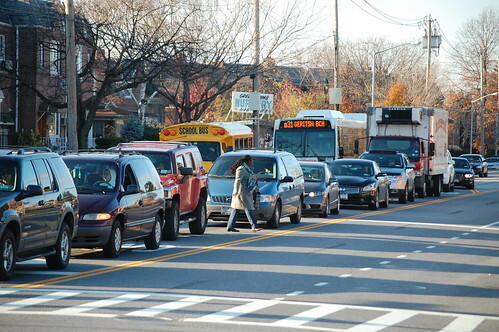 The bottom line is that motorists driving slower saves lives and the new, improved Gerritsen Ave. slows down motorists. @murray, I think we should take all four lane avenues and change them into one lane in each direction. 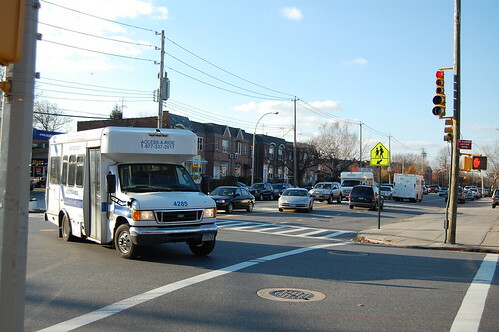 Let’s start with Flatbush ave. After that the DOT can do Flatlands, Emmons, and Ocean. Then, once these changes are implemented, I think some kind of force field should be created around the diagonal white lines so that reckless drivers can’t simply bypass stalled traffic, thereby creating a hazard to themselves, other disgusted, fed up motorists and, of course, pedestrians. @murray, Murray you are right, in a perfect world this would seem like a great idea. However, trucks already are sitting in the driving lane of Gerritsen to make deliveries to Key Food, so you have to venture into the yellow lines. A bus coming in the other direction didnt completely pull into the stop, now you have 2 directions of traffic in the “free for all” zone. At least when there were 2 lanes in each direction you had a legal way to avoid these illegal double parkers. I once got a ticket for “disobeying double yellow lines”. I was avoiding a double parked car, I always wondered what was I supposed to do? Sit and wait for the car to move? What is the right thing to do on Gerritsen? @murray, Obviously Murray doesn’t drive a car or have a job to go to anymore to see that there is actually a reason to do the city speed limit which is 25 (I think) NOT 5 mph or 0 mph! As far as saftey He//she did not see the vehicle overtaking the light (going through it) to get to avenue U and may not have seen the man almost getting hit by the Accessor Ride. What’s the deal with the new light colored font? It looks like crap. I want to read these messages, not struggle with them! Restore the dark or bold or whatever! I don’t want to tell you twice Danny! 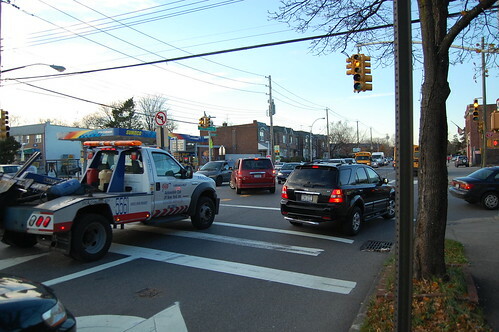 MarineParker.net » DOT reconfigures Gerritsen Avenue…for the worse? Excellent coverage. All good points. I have not yet been to Gerritsen Avenue since the change, but from what I read, this sounds like a nightmare. I wonder where these so-called DOT traffic engineers got their degrees from. This isn’t the first bad decision they’ve made, but it seems like one of the worst. The question is how do you get these idiots to listen? I wish I had the answer. So far I’ve only had limited success. I got them to remove a 20 mph turn sign that was hung too low and dangerous. They replaced it with a proper sign that fell down within 30 days after being hit by 60 mph winds. It was never replaced even after notifying them. They also removed two “Yield to Pedestrian” signs which they blocked by placing “school crossing” signs directly in front of them one month later, when I asked them just to relocate the signs. I also notified them of a one-way sign at Ave Y and E 11 Street that was placed about an inch from the street sign blocking it entirely so it can’t be read. That was about 9 months ago. It was never fixed. DOT makes the MTA look like a competent agency by comparison. I hope it doesn’t take a fatality for them to see their error on Gerritsen Avenue. If one does occur, then Palmieri will get the boot, not the commissioner. Remember, even after the SI Ferry disaster, Weinshall’s job was still safe. She should have been axed. The same thing will happen this time. They planted the trees in the island on Gerritsen & Avenue U today…during the morning commute! I have seen the BM4 cutting down Allen Avenue to start it’s run at the end of Gerritsen Avenue. I’m assuming it used the short cut to avoid the Knapp & Gerritsen intersection. Just an observation, and I wish I had a camera yesterday…. Heading back to GB on Gerritsen, I was at the light right before Knapp Street. Keep in mind, the turns onto Gerritsen from Knapp (by the bank) are supposed to be two specific lanes; one left and one right. 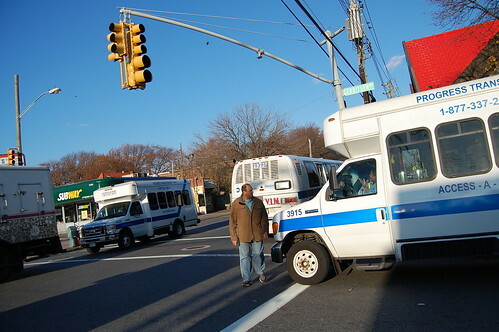 What I saw were cars/buses/trucks in both of these so-called turning lanes – heading right onto Gerritsen towards Keyfood. Gridlock central. One school bus had no choice but to sit in the middle of the street while cars cut him off as the light proceeded to turn green. 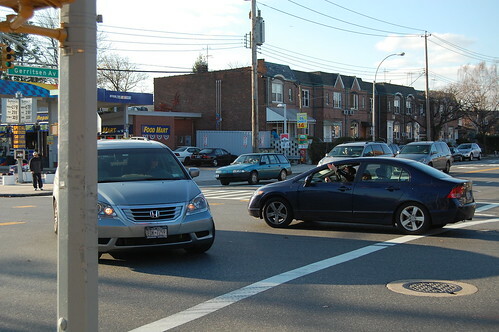 There wasn’t one single car making a right turn onto Gerritsen Avenue. All cars were merging and trying to squeeze into that single lane of traffic heading towards Avenue U. What a total disaster this project continues to be not to mention a total waste of tax-payers money. Whoever said that the money sunk into this project could have been better used elsewhere is right on the money. @Wow, Talk about the waste of money the city doesn’t even have! According to the Daily News the other day, King Bloomy is BORROWING all the money for these projects. What a mess!! that’s bloomy spending the money on something we didn’t need. oh what a Mayor!!!!!!!! I have lived on Stuart St, right off Ave U since 1965. I just got a ticket this morning from NYPD for making a left onto Ave U. I rarely ever make a left there However, the sign was down this morning and not there. Was the sign removed illegally? If so, the "no left turn" rule would still apply.